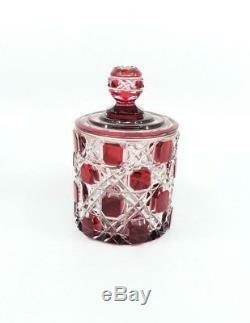 An Extremely Rare Antique- Ruby/Cranberry Red- Cut to clear crystal glass vanity Cologn Decanter bottle. 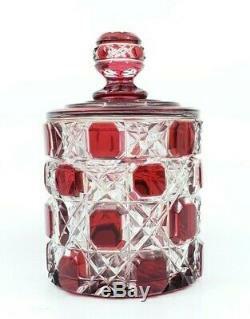 It has the gorgeous classic baccarat cane, Checkered design. The craftsmanship on this piece is top notch, exceptionally fine, high end and absolutely remarkable! It gets the most beautiful and enchanting shine when the light flickers as it hits the edges of the cut crystal. We believe it to be either Baccarat or from the American Brilliant Period. They were a part of a large Cut to clear Baccarat crystal collection, so we assume they might be Baccarat as well. Marked 10 on the inside of the stopper. I'm not sure if the bottom is marked with a number as well- I can't see it. It measures approx - 2.75" tall or 4" tall with the topper. Bottom, approx 2.2 wide diameter. Overall for age and aesthetically- It is in GORGEOUS condition! There is light surface wear- light scratches- most are concentrated on the very bottom. There are some stuck on dust, between the little crevices, that I couldn't clean. There are some tiny air bubbles inside the glass from manufacturing. There is some sort of hairline crack? On the back of one of the lids, where the red is missing? I'm not sure what that is as it's inside the glass and cant be felt. Shown in the last picture. There are a few tiny microchips on the rim as well as one on the top of the topper- there might be more that I'm missing but its impossible to see. It was very hard to capture with my camera the chips. This Gorgeous bottle is so very rare and a true piece of art! An AMAZING addition to a collector! The item "Antique Baccarat ABP Cut Clear Crystal Checkered Glass Ruby Bottle Decanter Jar" is in sale since Tuesday, March 12, 2019. This item is in the category "Pottery & Glass\Glass\Glassware\Cut Glass\American Brilliant". The seller is "dannyg420619" and is located in San Diego, California. This item can be shipped to United States, Canada, United Kingdom, Denmark, Romania, Slovakia, Bulgaria, Czech republic, Finland, Hungary, Latvia, Lithuania, Malta, Estonia, Australia, Greece, Portugal, Cyprus, Slovenia, Japan, China, Sweden, South Korea, Indonesia, Taiwan, South africa, Thailand, Belgium, France, Hong Kong, Ireland, Netherlands, Poland, Spain, Italy, Germany, Austria, Bahamas, Israel, Mexico, New Zealand, Philippines, Singapore, Switzerland, Norway, Saudi arabia, Ukraine, United arab emirates, Qatar, Kuwait, Bahrain, Croatia, Malaysia, Brazil, Chile, Colombia, Costa rica, Panama, Trinidad and tobago, Guatemala, Honduras, Jamaica, Antigua and barbuda, Aruba, Belize, Dominica, Grenada, Saint kitts and nevis, Saint lucia, Montserrat, Turks and caicos islands, Barbados, Bangladesh, Bermuda, Brunei darussalam, Bolivia, Ecuador, Egypt, French guiana, Guernsey, Gibraltar, Guadeloupe, Iceland, Jersey, Jordan, Cambodia, Cayman islands, Liechtenstein, Sri lanka, Luxembourg, Monaco, Macao, Martinique, Maldives, Nicaragua, Oman, Peru, Pakistan, Paraguay, Reunion, Viet nam, Uruguay.